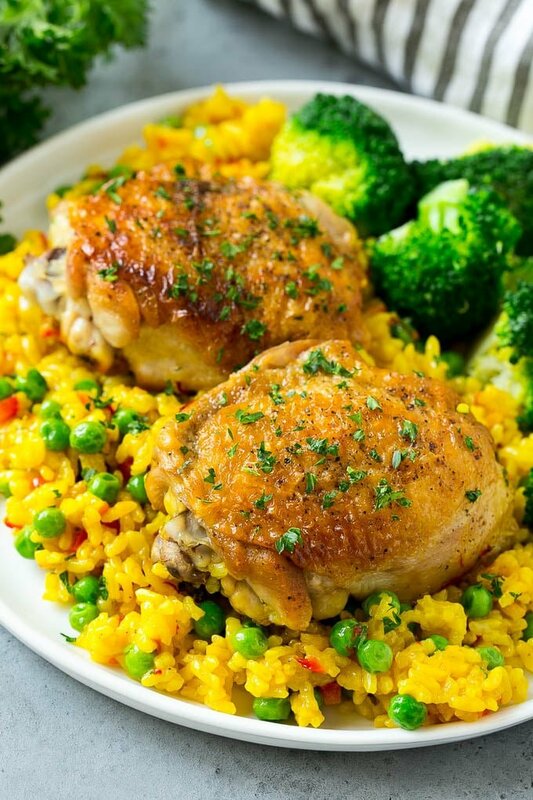 This recipe for Spanish Arroz con Pollo is a one pot meal that’s full of tender chicken thighs, creamy saffron rice and vegetables – the perfect quick and easy dinner! I’m all about simple dinners, and this chicken and rice dish is a complete meal in just one pot. You can customize your Arroz con Pollo to meet your family’s taste by adding different vegetables and seasonings. Here I am again, coming back at you with yet another one pot meal. 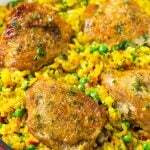 This time I’ve got an amazing recipe for Spanish Arroz con Pollo (Chicken with Rice). The chicken and saffron rice are cooked together along with some red peppers, onions and peas to make a delicious meal that’s fancy enough for company but easy enough to whip up on a busy weeknight. What is Arroz con Pollo? Arroz con Pollo translates to chicken and rice, and is a very popular dish in both Spanish and Latin American cuisines. It is similar to paella and contains chicken, yellow rice and vegetables. In Spain, the rice is colored yellow with the spice saffron. In Latin American countries, annatto is used to make the rice yellow. How do you make Arroz con Pollo? 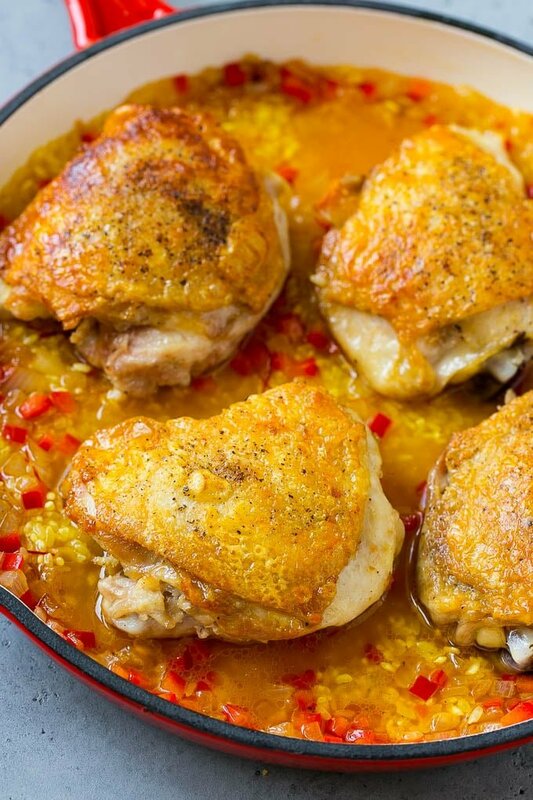 This recipe starts with bone in, skin on chicken thighs which are cooked to golden brown, then combined with rice, saffron, chicken broth and vegetables. Everything goes into a covered pot and bakes until the chicken is tender and rice is fluffy. Add a sprinkling of fresh herbs and dinner is ready! This recipe does utilize a few ingredients that you might not have in your pantry. Do you own a vial of saffron? If not, you should buy some. It can be a bit pricey, but a little goes a long way and it lasts for a really long time. Saffron gives this dish a unique and aromatic flavor and is well worth the cost. This recipe also uses a short grain rice. If you want to be really authentic, get yourself some Calasparra rice, that’s what they use in Spain. Otherwise you can use an arborio rice, pearl rice or a calrose rice, which is the inexpensive short grain rice available in my grocery store. This dish is perfect as is, or if you want to round out the meal a little more you can serve it with a green salad or a loaf of crusty bread. 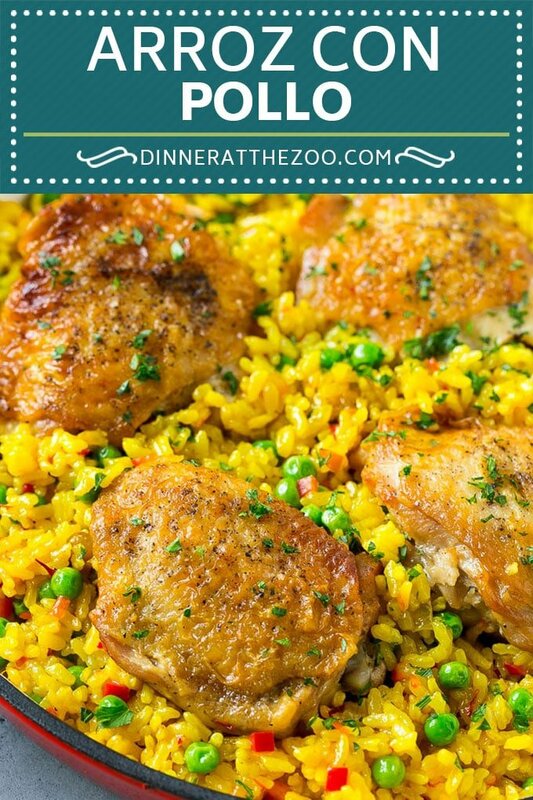 Everyone in my family loves this Spanish Arroz con Pollo but for different reasons – one of my girls loves the chicken but not the rice, the other likes both the chicken and the rice and my littlest just eats the rice. But everyone’s happy, and that’s all that matters. Oh, and of course it’s always a bonus to have a one pot meal with less clean up. 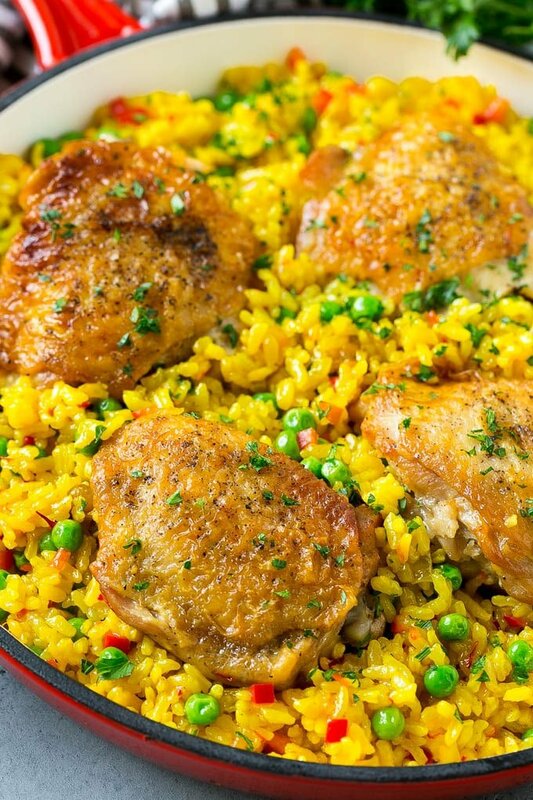 This recipe for Spanish Arroz con Pollo is a one pot meal that's full of tender chicken thighs, creamy saffron rice and vegetables - the perfect quick and easy dinner! Combine wine and saffron; let stand until ready to use. Season chicken on both sides with salt and pepper. Heat oil in a large pan over medium-high heat. Cook chicken, skin side down, until browned, 4 to 5 minutes. Flip, and cook until golden brown; transfer to a plate. Drain any excess oil, leaving 1 teaspoon of oil in the pan. 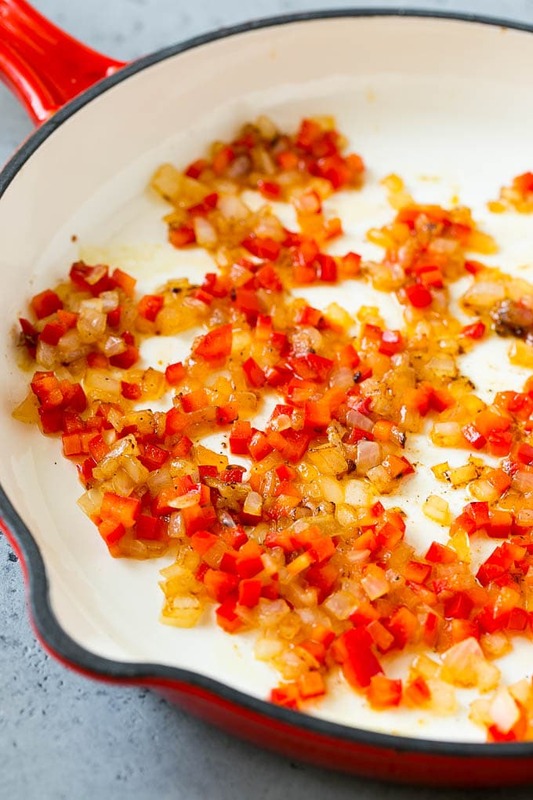 Reduce heat to medium and cook onion, red bell pepper and garlic, stirring often, until tender, 5 to 7 minutes. Stir in wine-saffron mixture, 3/4 teaspoon salt, 1/2 teaspoon pepper, and the bay leaf. Cook until wine is almost completely evaporated, 5 to 10 minutes. Add chicken thighs, broth and rice; bring to a simmer. Cover the pan and place it in the oven. Bake for 30 minutes. Remove the pan from the oven. Stir the peas into the rice. Top with parsley and serve. 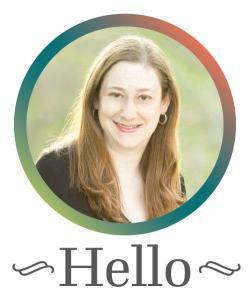 This post was originally published on May 17, 2015 and was updated January 1, 2019 with new photos and content. I forgot to rate this 10 star recipe I’m so sorry 😐 absolutely the best Paella recipe I’ve come across. I grew up in Spain we ate this often. My Mom used fresh seafood I live in Dallas today no fresh enough for me seafood around here . I made this with boneless skinless chicken breast I bought real paella rice from Spain from Amazon. I look forward to trying other recipes you post . Yum 😋 thank you 🙏. So happy to hear that you enjoyed it, I appreciate you taking the time to write! This looks like a paella. I would love to try this recipe, it looks so delicious and really tempting. This recipe looks amazing. Thanks for the easy steps. This chicken looks really good and very well seasons. This looks so delicious! 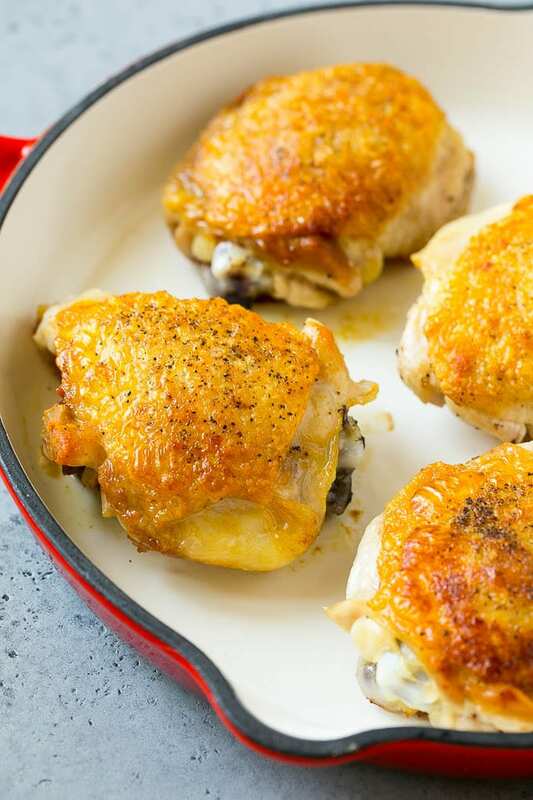 I know for a fact that my hubby is going to love this recipe, can’t wait to make it tonight!